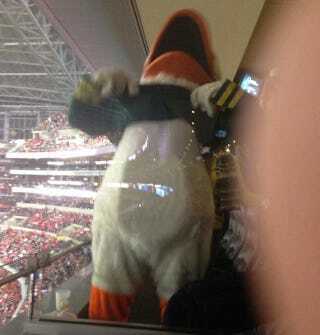 This is Puddles, the cuddly mascot of the Oregon Ducks, getting kinda nasty and baring its, uh, breasts(?) for some fans at last night's national championship game. The picture above comes to us from @GioAndJones, two CBS sports radio hosts who were at the game last night, and for whatever reason decided to start throwing money at Puddles. I don't know, man, football games are weird.